Having mused silently on "A crazy queen, old and jealous. Kneel down before me," Stephen expands his list of masters: "And a third, Stephen said, there is who wants me for odd jobs." The crazy old queen cannot be Victoria: she was dead by 1904, and England has already been spoken for as a master. She is almost certainly Ireland, in the ardently nationalistic person of the Shan Van Vocht. In A Portrait of the Artist, when his friend Davin says that "man's country comes first, Ireland first," Stephen replies, "Do you know what Ireland is? Ireland is the old sow that eats her farrow." He is not speaking only of his countrymen's small-minded religious and cultural intolerance, but of their complicity in subjugation: "My ancestors threw off their language and took another, Stephen said. They allowed a handful of foreigners to subject them. . . . No honourable and sincere man . . . has given up to you his life and his youth and his affections from the days of Tone to those of Parnell but you sold him to the enemy or failed him in need or reviled him and left him for another." In Circe the cannibalistic old sow and the jealous old queen morph into "Old Gummy Granny," who appears "seated on a toadstool, the deathflower of the potato blight on her breast." Stephen says, "Aha! I know you, gammer! Hamlet, revenge! The old sow that eats her farrow!" Granny turns out to be a demented religious patriot who urges Stephen to die a martyr's death. With two murderous British soldiers threatening him with bodily harm, she urges him to join in the game: "(Thrusts a dagger towards Stephen's hand.) Remove him, acushla. At 8.35 a.m. you will be in heaven and Ireland will be free. (She prays.) O good God, take him!" In Ulysses as in A Portrait, Stephen rejects the idea that he belongs to something called Ireland. "Ireland," he says in Eumaeus, "must be important because it belongs to me." 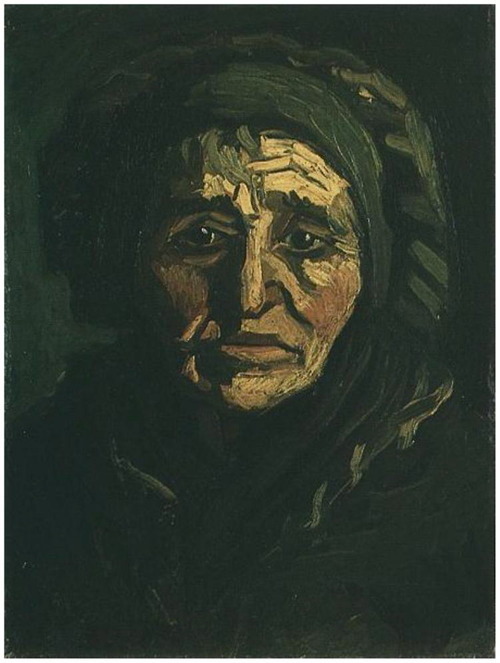 Vincent Van Gogh, Head of a Peasant Woman in a Greenish Lace Cap. Source: artoficeandfire.tumblr.com.